When some of those ancestors of yours are playing hard to get, don’t get discouraged. 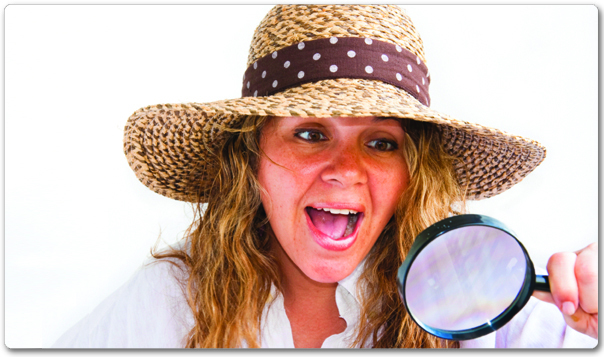 Don your detective hat (or in this case straw hat) and apply some of the techniques described here. Don’t give up when you hit a “brick wall.” Keep an open mind and look for alternate ways and sources to attack the problem. Sooner or later, as you work on your family history, you’ll hit a “brick wall.” A brick wall is a dead-end you’ve you’ve come to while researching one of your lines. It may be a small problem or a much larger one. You may have exhausted every avenue of research and are totally frustrated — but, don’t give up! “You probably have one in your family tree. A great grandfather who arrived on earth via outer space. A great, great grandmother known only as “wife of” her husband. A child without parents. A parent without children. An immigrant without a country of origin… You have exhausted the traditional avenues of research and don’t know where to go next. You may even be convinced that the records documenting your ancestor’s existence will never be found and have abandoned your search. “You have reached a brick wall, but not necessarily a dead end. Most brick walls can be dismantled given time and perseverance. “My personal brick wall began with a paper towel — one of the brown industrial types often found in public restrooms. It was 1969, the year I was born, and my mother and great-grandmother were sitting by my grandfather’s bedside in a hospital room, when my mother felt the need to ask about her family roots. In my mother’s own words, “All that had never seemed quite so important before on Daddy’s side since, after all, his people were all on this side of the Atlantic.” But with her father lying in a hospital bed losing his desperate battle with cancer, the need suddenly became very real. My great-grandmother, Pattie Crisp Owens, known to her grandchildren as Mammy Pattie, shared with my mother the precious little she knew about her family that day. These “brick wall” techniques are listed below. What do you know about your ancestor? Review it and write it down. Check your information. Have you made assumptions without sufficient proof? List what facts and dates are still missing? Figure out how to find them. Counties are often created from other counties. Make sure you’re looking in the right county for your time period. Still no luck? Try collateral family lines. Not where they should be? Get creative with surname spellings. Did they put down roots? Follow the land…and check out their neighbors. Still can’t find them? Start over! Visit this site for more details on each of these steps. The information on this page comes from an article titled: Breaking Down Walls, Brick by Brick by Kimberly Powell. We thank Kimberly for her insights.